I picked up a mixed lot of Reaper figures on the internet a few weeks back, thinking they would be useful to Pulp Alley and Dragons Rampant. First up were four ogres. 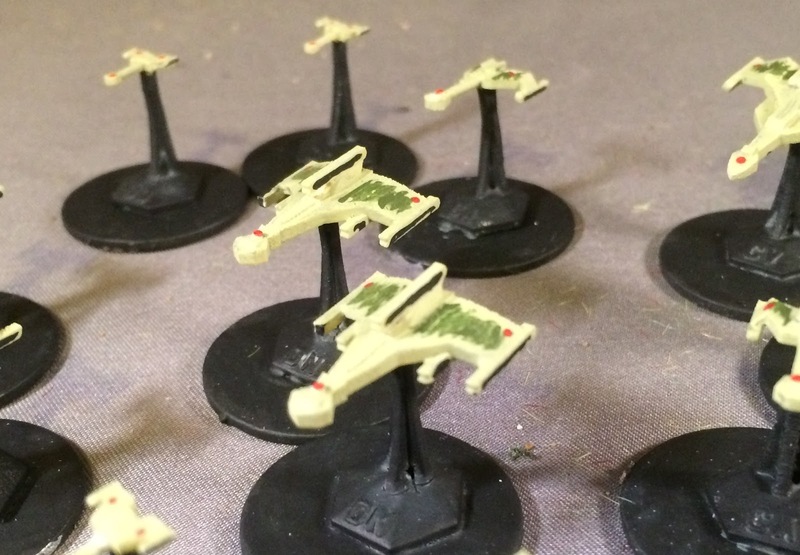 They got a white undercoat and then a bunch of washes. They are big figures (28mm Batgirl for scale). 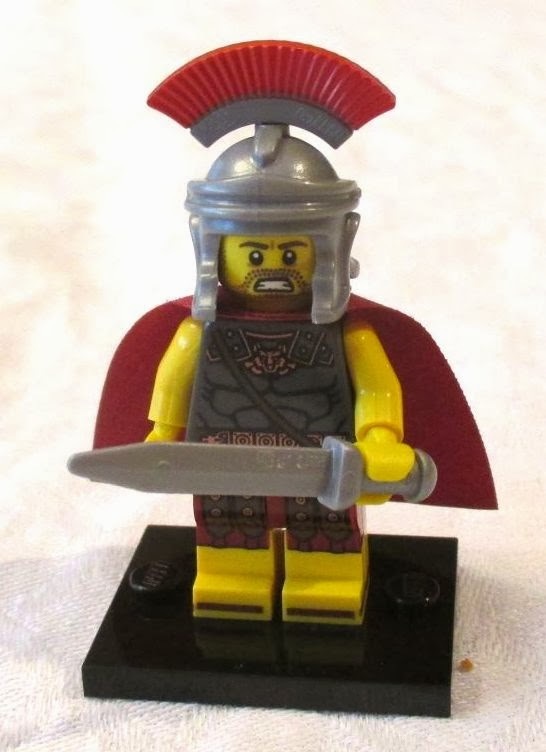 Each of the poses is unique and there is one armoured fellow. 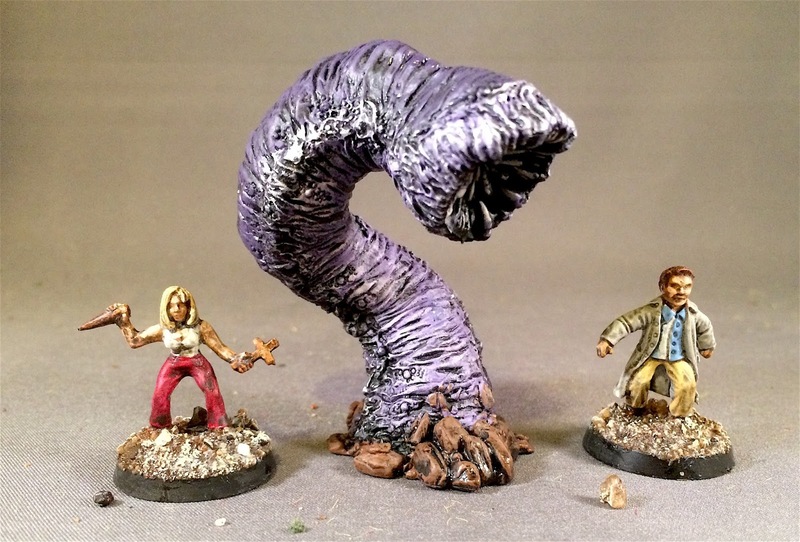 I'm still getting the hang of pictures with white undercoats (the figures glow more for the camera than for my eye) but the musculature turned out nice enough. 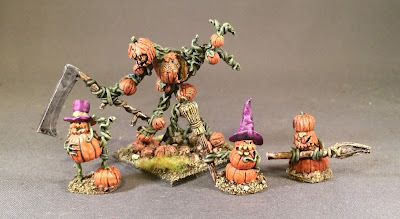 I also painted up four Hallowe'en-themed pumpkin figures. Again, white undercoat with washes and some highlights. 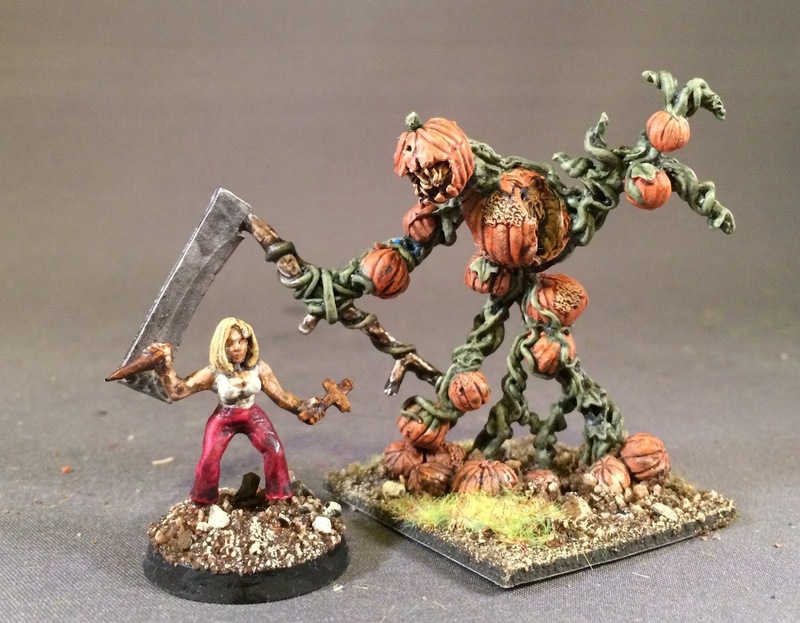 The pumpkin-vine creature is really big (25mm Buffy for scale). The orange looks a touch washed out here and pops more in person. 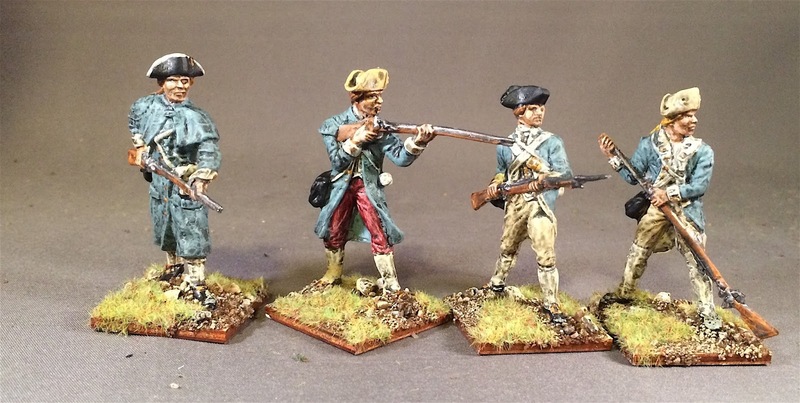 Up next: A bunch more 25mm figures are on the workbench--awaiting a delivery of clear plastic bases. 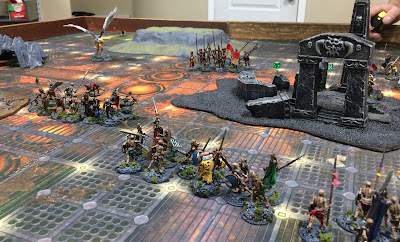 Two weeks ago, Bruce and I played the newest version of Crusader Rex with an eye to using it as a campaign engine for miniature games. 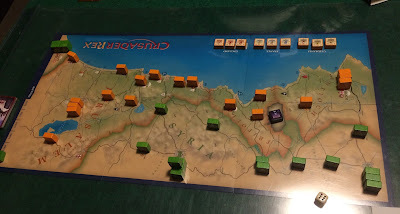 Overall, an okay game but the version 2 rules forced some dispersion on the troops and made storming fortresses tough to win (which both augur against battles). 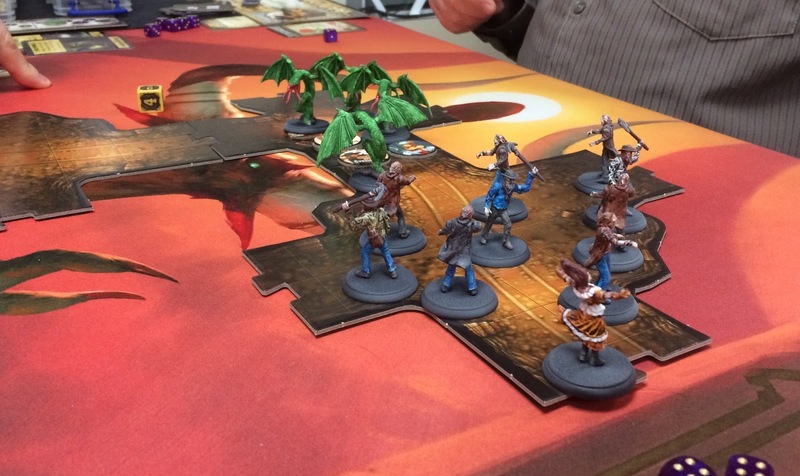 Bruce hauled out the versions 1.4 rules this past week and we tried again. The major differences were a change in victory conditions, easier storming of forts, and higher levels of troop support. 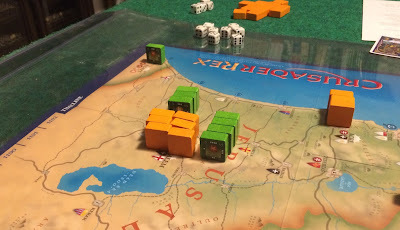 The early game saw the Saracens grab the mid-board (which may have been a strategic error--it was only my second game). 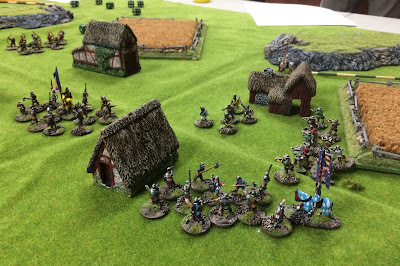 Not a lot changed in the mid-game, but I didn't inflict many casualties which was bad for green as the game swings towards the Franks as it progresses. 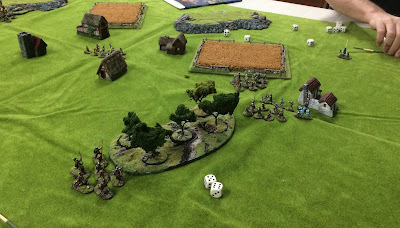 Bruce attacked in the south and ran into my insanely hot dice. Poor guy! Dice also thwarted some pretty nice spoiling moves he made as I positioned for an attack on Jerusalem. We did generate five battle (I think) that are gameable. In the end, it was out of reach for the Franks in the last year as we called it as a very marginal victory for the Saracens. Overall, I like the v.1.4 rules better (except maybe the lower victory value of for Jerusalem--a higher value motivates behaviour more in keeping with the politics). Overall, a good game with bad strategy being saved with hot dice (story of my life!). For Christmas, Santa brought me some Buffy the Vampire Slayer minis in 25mm. These have a real 1990s vibe to them, with lobster hands and gun-fight poses but they do a pretty decent job of capturing the characters. Above we have Giles, Xander, Willow and Cordellia. Below, Spike, Buffy, Tara and Angel. I had to do a few swaps as there wasn't a Xander or Cordellia figure so rand0-vamps were converted with paint. I primed these white and painted with washes. Combined with white skin and black duds, that lead to some issues when taking pictures so pardon the washed out snaps. Below we have the Master and Drusilla (centre) with two more rando-vamps flanking them. I also bought a fistful of Reaper plastics on line. 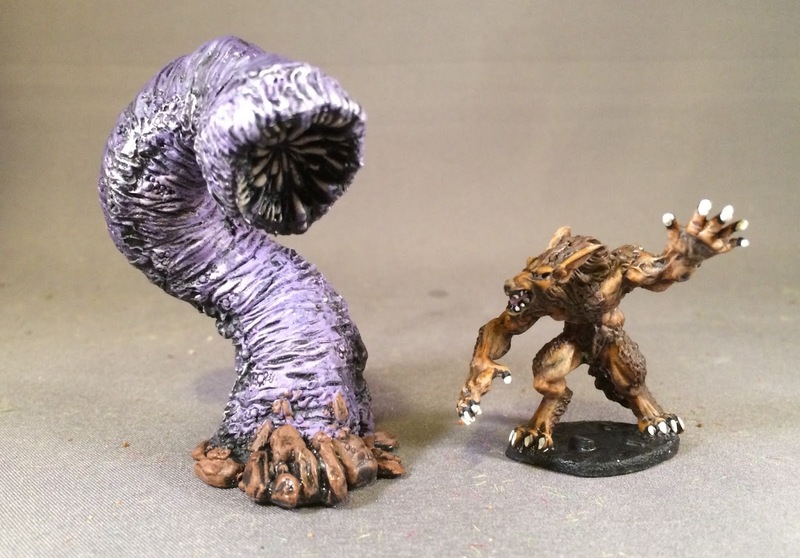 These include the worm and werewolf below. I think these were pre-paints? So I added some highlights and wash. There are quite a few more of these to come, although the rest require painting. 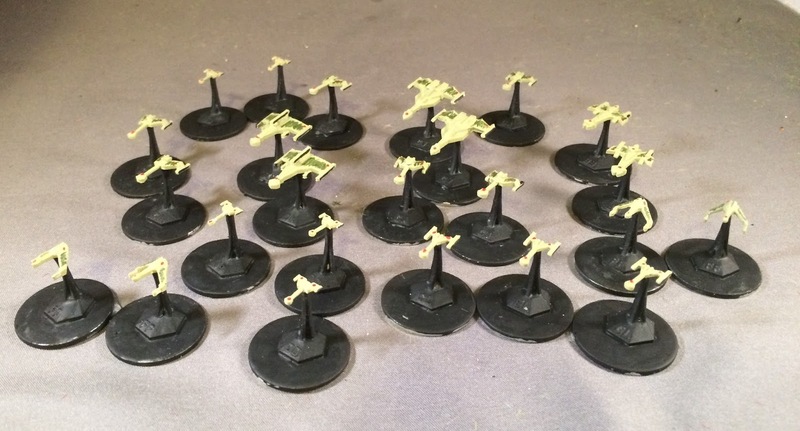 Up next: some clix-repaints, assuming clear bases arrive. We had seven guys out at the club this week. 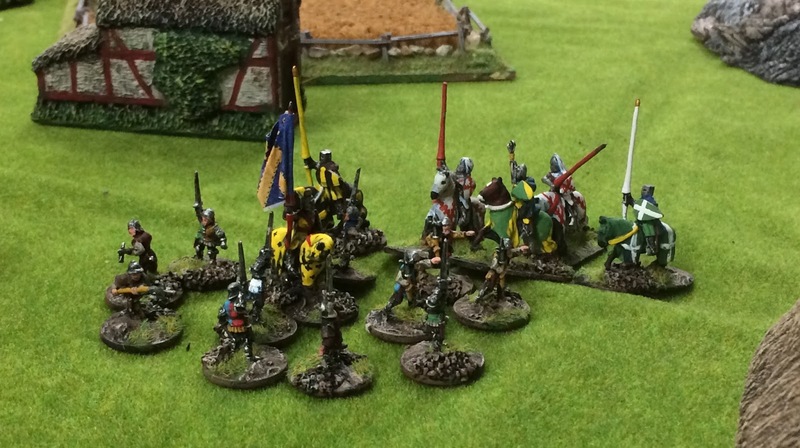 Bruce brought out a game of Lions Rampant in 15mm. The French had to light some buildings on fire to drive out the dastardly English. Bruce and I drew French while Scott and Taylor play the English. The French moved in from the right side of the board towards where the buildings were. We had good activation rolls at the start but then our luck started to turn. Both sides met in the town and the French had zero luck setting buildings on fire. 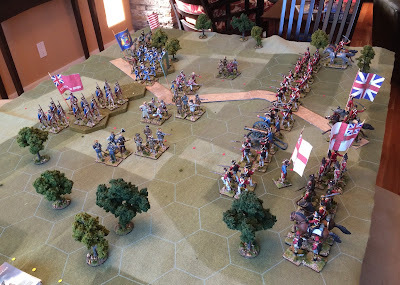 Scott had amazing dice rolls for activations and that was bad news for the French. Eventually, we got whittled down and shot to pieces. Our retreat was very undignified. Dan hosted Terry in a game I didn't get the name of. 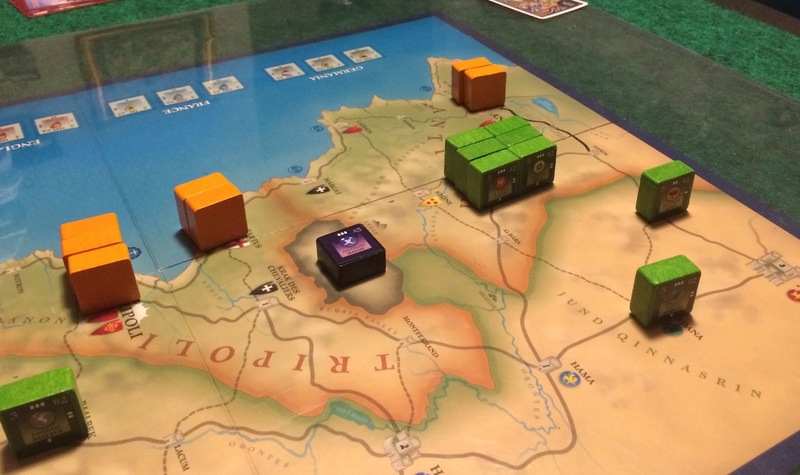 Chen joined Bruce and Scott for a second game of Lions Rampant, where Scott's dice rolling returned to form. Taylor and I hoped over to another table and he hosted me in a game of Dragons Rampant. 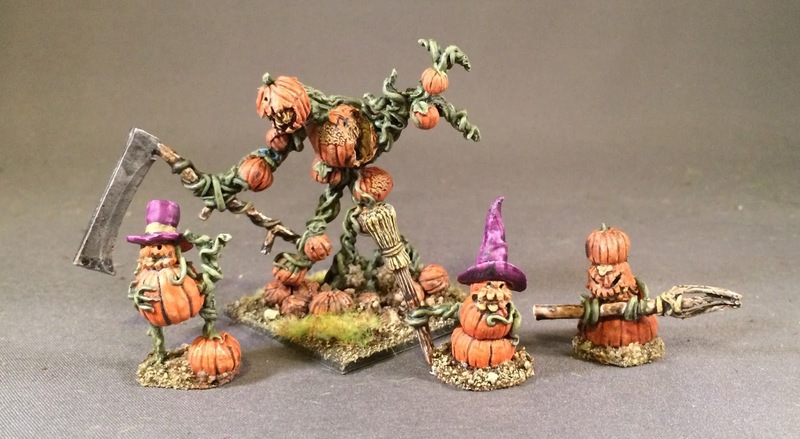 It was the skellies versus GW figures from the 1990s. There were a lot of casualties and, in the end, we were stuck with an interesting tactical situation. I had all three objectives but no way to trigger the end of the game (killing one of his units) without moving off of them. Taylor held no objectives but, if he killed any of my guys, the game would end and I would win because I held two of the three objectives. Very interesting! Santa gifted me with a small collection of 25mm apes in boilersuits from Eureka games. 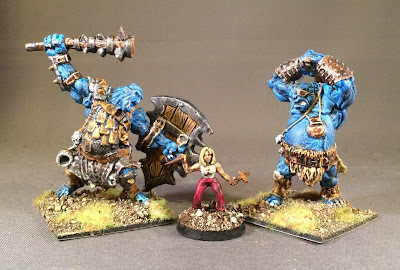 These will make good team in Pulp Alley. It was too cold to spray prime these guys black over the holidays so I painted on some white gesso I had and painted them using washes. The result is a touch list for my tastes but you get to see the details the sculptor put on quite well. Terry's basement also kindly gifted me with two water tanks he picked up at a swap meet a long time ago in a Lion's Hall far away. 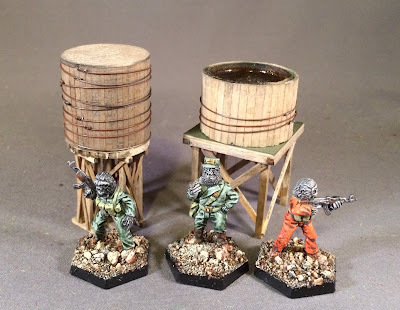 These are nice little terrain pieces that can sit on or beside buildings. 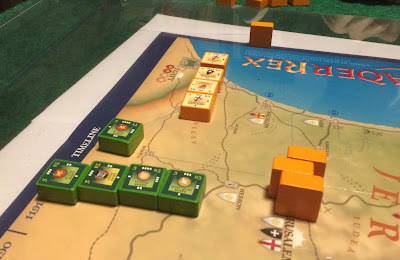 Bruce hosted a game of Crusader Rex on Tuesday. I'd never played so picked the Saracens (green) to try. The first part of the game seems to favour them while the Crusaders must build their strength. ...and Jerusalem in the south and bagged both. By the end of the first year I had a lot of control but my troops were pretty beaten up. 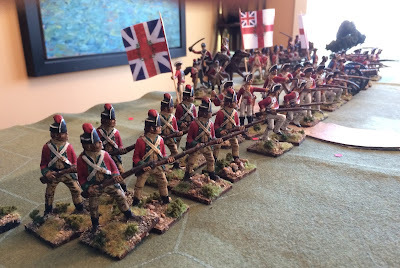 It took me awhile to get the hand of reinforcements and building troops. Bruce took advantage of that and nearly bagged Egypt (Cairo?). Then his crusaders started showing up and he pushed in to the north. Fortunately for me, he ran out of time. A big part of winning turn don a slight mistake he made early on (compounded by some unpredictable card play effects) that cost him several blocks in Egypt. But I'd rather be lucky than good anyhow! I pushe out another two units of 54mm AWI provincials. These plastics are a mixed lot so size varies some as does their equipment. As with past groups, I painted up the provincials in lots of four (companies sharing a jacket and cuff pattern). So today we have the blue-whites followed by the brown-greens. It is interesting to come back to many of these sculpts in 54mm after having painted them in 1/72 scale. 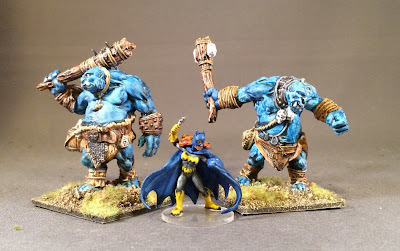 up next: Some gaming and some 25mm apes. We had 7 guys out at the first club night of the year. 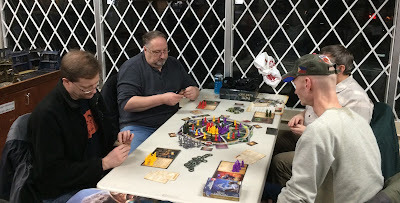 Terry hosted Wiley, Richard and Craig in a game of Fate of the Elder Gods. I brought Small World. 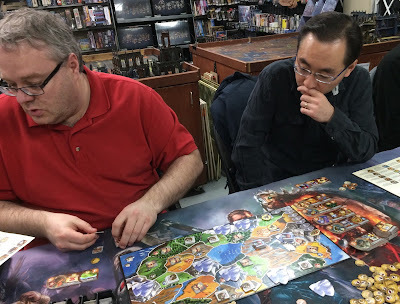 Scott and I got a quick learning game in and then Chen joined us for a three-player throw down. Chen crushed us. Scott describe the game as ethnic cleansing that the whole family can enjoy (which is basically what Small World is). I also got some time in at the painting table and managed to push out the second half of this 1/7000-scale set of space ships. 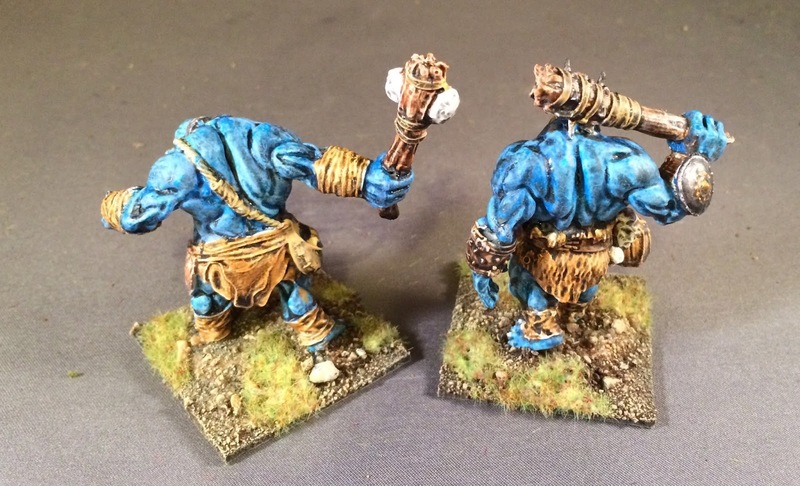 These are on 20mm bases and a very tiny so doing anything beyond a quick base coat was a challenge. But they are finished and I need to now sort out some rules for them after finding my hex star matt one the holidays. 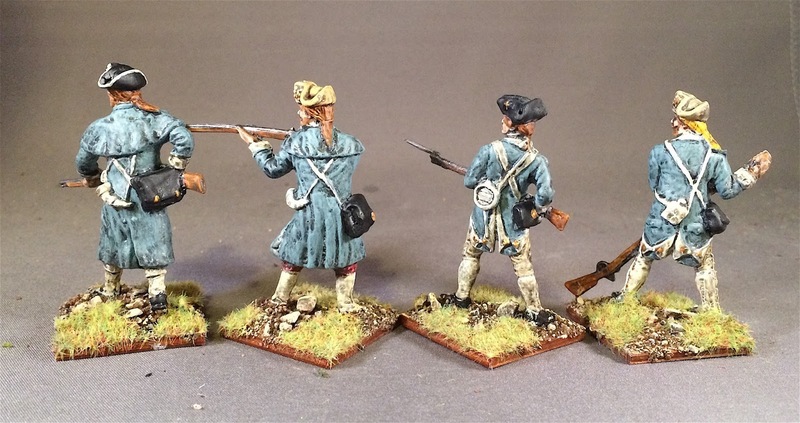 Up next: Some more 54mm soldiers and some ape men. Scott and Terry popped in for some holiday gaming last weekend and I hauled up my 54mm AWI troops from the basement. 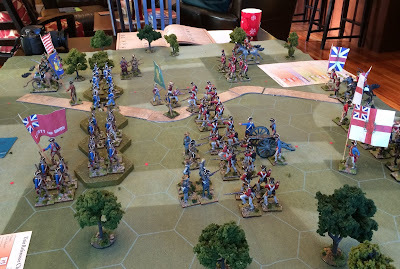 We were going to play Monmouth but it turns out I'm short a few cannons (still in a box unpainted) so instead we played Guilford Courthouse. We used the new CCA Tricorne rules. A solid line of Brits attacks a three-deep formation of Yanks. 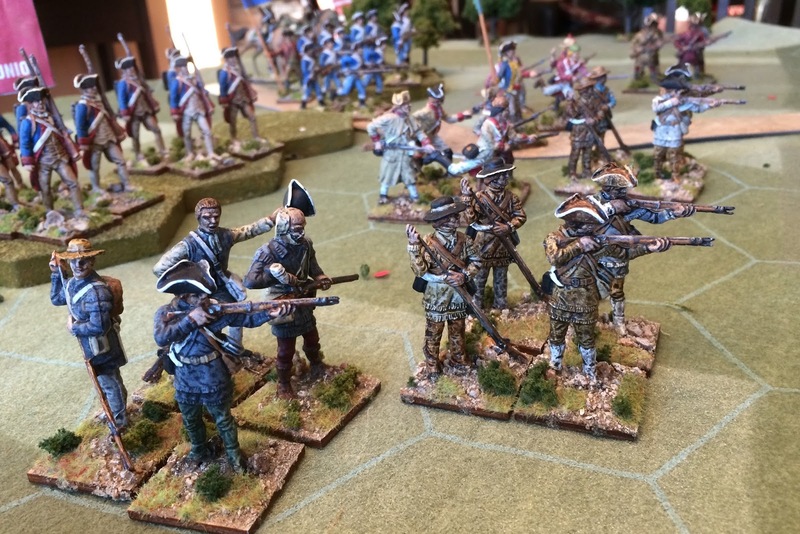 Terry's riflemen fired during the cannonade phase and then fell back. Scott then pushed forward his line and start to pick apart the weak American troops in the first line. 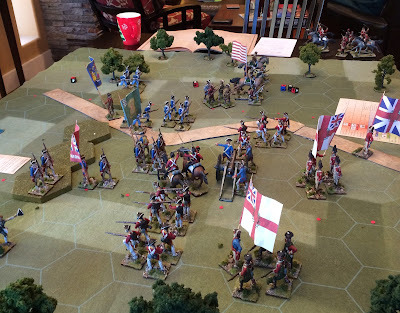 Terry was hampered by his lack of cards on the US right (foreground) for much of the game. At this point, things were looking a bit dire for the Americans, with the Brits up 4-0 (seven banners was victory). 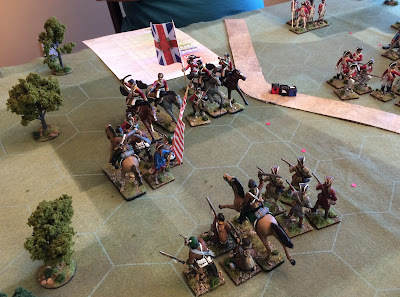 Terry spent some time working forward his cavalry (background) while sniping at Scott's still impressive line. Suddenly, Terry unleashed a sustained cavalry charge (supported by list riflemen) on his left and routed two of Scott's units of lights. Terry then laid into the cavalry who were driven back and off the field. 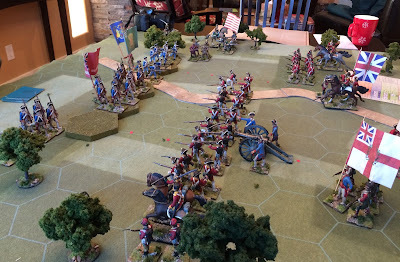 At the same time, Scott push hard on the American rights, trying to keep pace with Terry's banner count and get the US flank turned. 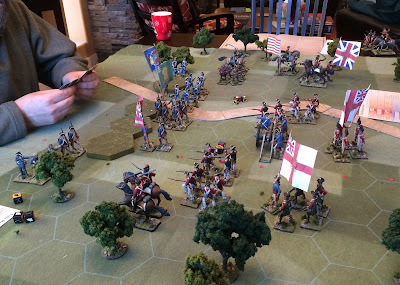 Terry made a last hard shove in the centre and broke a couple of Scott's units (Scott's dice were terrible all afternoon) and the British ceded the field. Overall, a satisfactory game. We worked out a few more of the fine points of the rules. And we wrapped up with a game of Love Letter (that Terry also won).